European researchers have detected a planet – just slightly more massive than Earth – orbiting very close to Alpha Centauri B, a sun-like star only 4.3 light-years from our Sun. Astronomers have discovered an alien planet right in our solar system's backyard, but residents of Earth shouldn't get their hopes up for an exploration mission anytime soon. The newfound world is much too far away for probes to visit using current technology, experts say. Researchers announced Tuesday (Oct. 16) that the scorching-hot alien planet Alpha Centauri Bb, which is about as massive as Earth, resides in the three-star Alpha Centauri system. While no other star is closer to our sun than the Alpha Centauri trio, they're still about 4.3 light-years away, making a close-up look at the planet pretty much impossible right now. 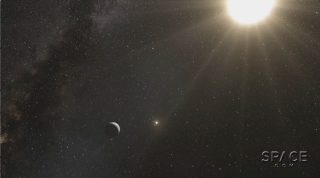 A robotic exoplanet mission launching today "would require about 40,000 years to get to Alpha Centauri," Greg Laughlin, an astronomer at the University of California, Santa Cruz, told reporters Tuesday. "So, given our propensity for instant gratification, that's not really an option that's on the table." But Laughlin, who was not involved in the discovery, added that attitudes could change if researchers made a few more intriguing discoveries in the Alpha Centauri system. To put this huge distance into perspective: NASA's Voyager 1 probe, the most far-flung object ever launched from Earth, is currently about 11.3 billion miles (18.2 billion km) into its journey, cruising toward the edge of our solar system. Voyager 1 has thus covered less than 0.05 percent of the distance to Alpha Centauri Bb — and the probe has been zooming through space for more than 35 years. Alpha Centauri Bb sits just 3.6 million miles (6 million km) from its sunlike star, completing one orbit every 3.2 days. As a result, the planet's surface is far too hot to support life as we know it, researchers said. But the solar systems containing a small, rocky world often have multiple planets, Laughlin said, so it's possible Alpha Centauri Bb has some siblings — perhaps even a world or two out in its host star's "habitable zone," the range of distances that can support liquid water. If subsequent investigations do indeed find a potentially habitable planet circling Alpha Centauri B — or one of the other two stars in the system, Alpha Centauri A and Proxima Centauri — they may provide the push to get a probe out there, Laughlin said. "You might see a groundswell of excitement to look at new kinds of propulsion technologies, new kinds of missions that could get to Alpha Centauri — not manned, but putting an unmanned probe there in a relatively short period of time, human-lifespan kinds of time frames," he said. Whenever such advanced technology becomes workable, it might send people as well as robotic probes hurtling toward Alpha Centauri; the system is one possible target of the 100 Year Starship initiative, a project that aims to lay the foundation for interstellar human spaceflight. So anyone who longs for humanity to colonize other solar systems should probably be rooting for astronomers to find a planet somewhere in the habitable zones of the Alpha Centauri system. "I think it really comes down to what the inventory of these stars looks like, whether there will be the extraordinary effort and excitement that are required to do those sorts of really groundbreaking things," Laughlin said.